Die Wei?e 1 von Staffelkapitan 10. /JG3 Leutnant Hans Weik im Juli 1944 in Memmingen. 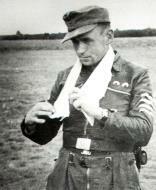 White 1 of Echelon commander 10th / JG3 Leutnant Hans Weik July 1944 at Memmingen. Fw 190A-8/R2, "černá 13", velitele 11. (Sturm)/JG 3 "Udet" Oblt. Wernera Gertha v podobě, v jaké se nacházel v Illesheimu v červenci 1944. Werner Gerth dosáhl svého prvního úspěchu u 7./JG53 v jižní Itálii v létě 1943, byl však 17. září 1943 zraněn během náletu na Ciampino. Po uzdravení nastoupil jako dobrovolník k Sturmstaffel 1, u níž se stal jedním z nejúspěšnějších pilotů. První čtyřmotorák sestřelil 22.2.1944. Když se Sturmstaffel 1 stala částí IV/JG3, byl 20.4.1944 jmenován velitelem její 11./JG3 (ta byla později přeznačena na 14./JG3). Dne 29. října 1944, po dosažení 26 vítězství, obdržel Rytířský kříž. Poslední boj absolvoval 2. listopadu 1944, kdy byl v Fw 190A-8/R-2 W.Nr. 682057 při útoku na B-17 nad Halle smrtelně zraněn. V tu dobu mu bylo 21 let. Přesný počet jeho vítězství není zcela jasný, nejčastěji se udává 27, z toho 22 čtyřmotorových bombardérů. Die Gelbe 3 mit Feldwebel Otfried Baisch (rechts) und seinem Bruder Roderich am 17. Juli 1944 in Memmingen einen Tag vor seinem Tode uber Schonbrunn. Yellow 3 with Sergeant Otfried Baisch (right) and his brother Roderich 17th July 1944 taken at Memmingen one day before his death over Schonbrunn. Die Gelbe 6 mit Feldwebel Gerhard Leipholz mit den Zusatzpanzerungen 1944 in Memmingen. Yellow 6 with Sergeant Gerhard Leipholz with the additional armorparts 1944 taken at Memmingen. Die Gelbe 17 mit Unteroffizier Willi Unger mit dem Krebsgerat einer 21 cm nach hinten feuernden Rakete aufgenommen im Mai 1944. The Yellow 17 with Sergeant Wille Unger and its Krebsgerat a 21 cm backwards firing rocket photograpf taken in May 1944. Remarks:One known victory, his 1st, a B-17 (HSS) near Aschaffenburg on 13 April, 1944. His 2nd, a B-17 30 km SE of Memmingen on 18 July, 1944. Remarks:KIA 2 November, 1944, in Wk# 682057 when he reportedly rammed a B-17 headed for the Gelsenkirchen Oil facility. After the collision, he was unable to bail out of the falling mass of wreckage. There is little evidence to support the ramming. His wingman this date, Fw Oscar Bösch, indicated Gerth was shot down by fighters. In addition, he was reported to have bailed, but his chute did not open. Promoted to Hptm posthumously. One of the most daring of the JG-3 pilots, he was shot down nearly a dozen times. He was known to have lost a JG-300 aircraft on 2 January, 1944, circumstances unknown. One known victory, a B-17 at Bielefeld on 22 February, 1944, while in Sturmstaffel 1. His 4th & 5th, both B-24's; one at Salzgitter, the other at Haldersleben, on 11 April, 1944. His 7th and 8th, both B-17's, one NE of Gifhorn and one at Miesterhorst on 29 April, 1944 (Perry Claims). His 10th, a B-17 at Fehmarn Belt on 19 May, 1944. His 15th, a B-17 SE of Kempten on 18 July, 1944. His 20th, a B-24 at Lechtaler Alpen on 3 August, 1944. His 25th, a P-51 at Quedlingburg on 11 September, 1944. Bowers/Lednicer, 30+ victories. Remarks:KIA 1 January, 1945; shot down in his A-8 by F/Lt H.P. 'Gibby' Gibbons of RAF No.168 Sq. JG-3 was attacking the British airfield at Eindhoven, when Leipholz was hit from behind. Gibbons was downed during the same skirmish. Another source says it was RAF 124 Wing Cmdr. C.D. 'Kit' North-Lewis who shot him down, before he too, was shot down. One known victory, a B-17 NW of Halle on 2 November, 1944. His 2nd, a B-26 at Büllingen-Stavelot on 23 December, 1944. Alternate spelling: Leipolz & Liepholz. Remarks:Started pilot training in late 1942, after two years as an AC Technician. One of the most successful Sturmjager (Ram Fighters) in the Home Defense. Shot down three times, the 3rd being on 3 August, 1944 after downing a B-24. He was hit by the bombers return fire over the Lechtal Alps in 'Yellow 7', bailing safely. 59 combat missions. 19 bombers. 3 victories in the East. His 1st victory, a B-17 at Warnemünde on 11 April, 1944. His 5th, a B-17 35 km E of Kassel on 19 April, 1944. His 10th & 11th, both B-24's in the Oschersleben area on 7 July, 1944. His 12th, a B-17 30 km SE of Memmingen on 18 July, 1944. His 13th, a B-17 at Zeitz-Groitsch on 29 July, 1944. His 14th & 15th, both B-24's at Füssen on 3 August, 1944. His 16th & 17th, both B-17's at Brünn on 29 August, 1944. His 18th, a B-17 at Hettstedt on 11 September, 1944. His 19th, a B-17 N of Berlin on 12 September, 1944. His 20th, a B-17 NE of Kölleda on 7 October, 1944. His 22nd, a P-39 7 km SE of Stargard on 19 February, 1945. Nos. 23 & 24, both Pe-2's in the Griefenberg area on 15 March, 1945. No victories in the Me 262. Flugbuch (2/44 to 3/45). Hans Weik was born on 6 July 1922 at Heilbronn in Wurttemberg. He joined the Luftwaffe in October 1941. Following completion of his flying training, Weik was posted to I./JG3 based on the Eastern front. On 21 February 1943, as a Leutnant, he joined the Geschwaderstab of JG3. His first victory was achieved on 9 March 1943 when he shot down a Russian Yak-1 fighter. He was to record 10 victories during his time in Russia, including two victories on 21 April to record his 10th and 11th victories. From May to November 1943, Weik served as fighter pilot instructor with 4./Erganzungs-Jagdgruppe Ost. However, his duties as an instructor did not preclude combat for on 6 September 1943, he downed his first four-engined bomber, a USAAF B-17. In November 1943, Weik was transfered to 9./JG3. On 10 February 1944, Oberleutnant Alfred Humer (21 victories), Staffelkapitan of 10./JG3, was killed in action and Weik was named his successor. He received the Deutsches Kreuz in Gold on 10 May. Between February and July, Weik was to claim 23 victories, including 20 four-engined bombers, in only 85 combat missions. He recorded two four-engined bombers shot down on 8 March (20-21). He was to record two victories on four other occasions. Weik also recorded three victories on 24 April and 8 May. On 18 July, he destroyed a USAAF B-17 four-engined bomber, but he had to bale out of his damaged Fw 190A-8/R2 (W.Nr. 680 747) 'White 7' wounded in the shoulder and arm. The wounds were serious enough to keep Weik from any further front line duties. On 27 July, Oberleutnant Weik was awarded the Ritterkreuz for 36 victories. In April 1945, Weik was transferred to III./ EJG2 at Lechfeld to train on the Me 262 jet fighter. Post war, Weik studied architecture. He planned and built many schools, sports auditoriums and other buildings. In retirement, Weik indulged his passion for model shipbuilding. Weik died at the age of 78 on 5 June 2001 at Heidenheim an der Brenz. 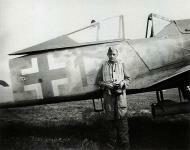 Hans Weik was credited with 36 victories in only 85 missions. He recorded , 25 victories over the Western Front, including 22 four-engined bombers. He was one of the foremost Viermottoters.